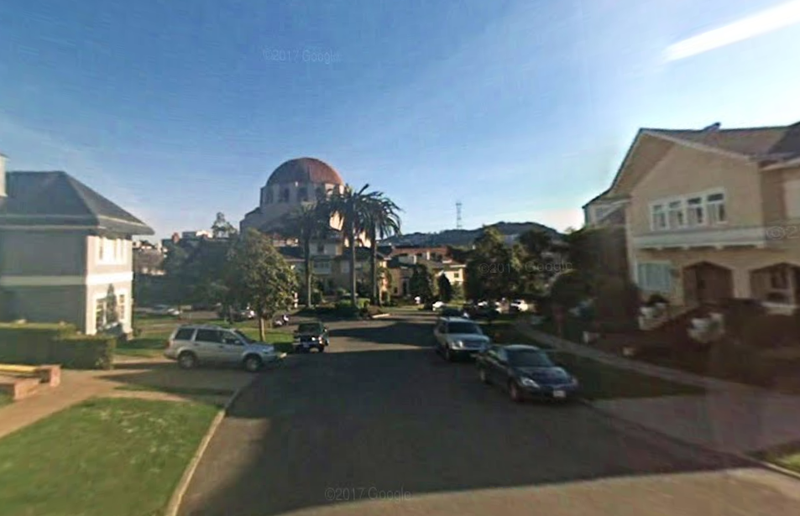 An enterprising couple from the South Bay was just able to purchase a neighborhood street from an online auction because of an accounting error, The San Francisco Chronicle reports. Now the neighborhood is worried about the ways the couple might try to cash in on the purchase. The couple, Tina Lam and Michael Cheng, who run real estate firm Archers Capital, bought Presidio Terrace, a one-block oval street just northwest of downtown San Francisco. It is surrounded by multimillion dollar mansions (here’s the Google Street View), and up until 1948, it was racially segregated. That is, a few decades ago, Tina and Michael couldn’t buy a house on Presidio Terrace. Now they own it, and they might start charging residents for parking, The San Francisco Chronicle reports. The attorney for the homeowners association says the reason why the bill hadn’t been paid was because, since the 1980s, it had been mailed to the address of the wrong accountant. The result of decades worth of the city sending bills to the wrong address tallied up to $994 worth of unpaid taxes, fees and interest, which San Francisco decided to try to get back by putting the street and its sidewalks up for auction about two years ago. Cheng, a real estate investor, and his wife were looking for opportunities at the time, saw the street for sale, and jumped on it, dropping $90,100 on the property. I was shocked to learn this could happen, and am deeply troubled that anyone would choose to take advantage of the situation and buy our street and sidewalks. It’s no surprise that residents are pissed that they might have to pay for parking on the private street just outside of their homes. But at the same time, keep your damn mailing address up to date—this is like, the most pathetic financial error ever, right up there with forgetting to update an autopay after a credit card expires. These are the basics, people. Correction: This story has been updated to clarify that the issue was with the homeowners association’s accountant’s mailing address, not the city’s.